CoinFac Limited recently introduce the next generation quantum computing technology into cryptocurrency mining, allowing current Bitcoin and Altcoin miners to enjoy a 4,000 times speed increase. In the cryptocurrency world, one company is making wave in this industry with its revolutionary feat. CoinFac Limited, a new kid on the block reportedly began its heavyweight entrance with the infusion of Quantum Computing technology, a booming $550 million USD industry, into Bitcoin and cryptocurrency mining arena. This instantly sends Bitcoin trading prices spurring upwards by 3.5%, with a positive market sentiment driving the momentum. Quantum computing is vastly acknowledged as the next generation of supercomputers capable of processing dense digital information and generating multi-sequential algorithmic solutions 100,000 times faster than conventional computers. With each quantum computing server costing at an astronomical price tag of $5 Million - $10 Million USD, this revolutionary concoction comprising cutting edge technological servers with a new wave of currency systems, brings about the most uprising event in the cyber world of cryptocurrency. True to the statement, Google, NASA and Microsoft have been in close talk with the developers of a possible integration using quantum computing into their existing products and platform. Bitcoin mining is the process of earning bitcoin through solving of difficult algorithmic equations in the Bitcoin spaces. These equations will gradually become more complex in nature, thus increasing the difficulty of mining processes. “Through the use of quantum computing, usual bitcoin mining processes are expedited by a blazing speed of 4,000 times. 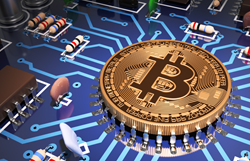 We bring lucrative mining back into Bitcoin industry, all over again,” says Mike. CoinFac Limited, a technology company established 2016 in Hong Kong is owned by Palantir Technologies Incorporation, a private American software and services company, specializing in data analysis and technological software research. Founded in 2004, Palantir's is currently the top 30 most valuable companies in Silicon Valley with a valuation of $15 Billion USD reported in 2015. With the ability to mine cryptocurrency at an unbeatable hashing speed of 280,000 GH/s, CoinFac is set to achieve stellar revenue in the Asia Pacific region and possibly across vast general Bitcoin miners. “With our strong and unique solution we are offering, we are set to breached the $50 Million USD by the end of this fiscal year,” said Mike.